Over the past few weeks, I’ve had the opportunity to spend time working alongside incredible NCTE members, listening to their stories and learning from their insights. From program planning for the 2018 Annual Convention to recognizing our members are doing really important things across the country right now, what I have noticed in my recent interactions with English and language arts teachers is an urgent desire to listen to and act upon their students’ voices and let them be heard. Our students’ voices matter. Their voices matter in our schools, our communities, and beyond. As teachers, we want our students to discover their own voices. We want them to know the power of their voices. We want them to know the power of others’ voices, and we want them to know the power of their collective voices. Most important, we want to help them discover how their voices might impact our world and to be empowered to use their voices to speak out for equity and justice. Franki’s call was answered by more than 2,000 proposals, each of which was reviewed online by at least three people before being reviewed again by the program planners that weekend. 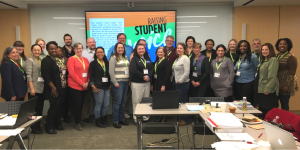 Volunteers represented each section of NCTE (Elementary, Middle, Secondary, and College) and each of the strands represented in the Annual Convention program (Research, WLU, Rainbow, Early Childhood, LGBTQ, NWP, and Teacher Education). I watched and listened as our dedicated volunteers wrestled with each difficult decision, trying to assemble a program that will uplift the teachers who attend and the students to whom those teachers will return. Program planners worked hard to select an incredible set of sessions for #NCTE18. The program planning meeting felt a little extra serious because a national display of the power of student voice was unfolding as we met. Students from Marjory Stoneman Douglas High School were speaking out at rallies and the country was reacting to the power of their words. This was something I saw our community of members grappling with in the program planning meeting room, on social media, and in calls I’ve been on ever since. Student activism is inspiring, but this isn’t the first time we’ve seen it happen. It’s always been at the heart of social change, and teachers have long pondered the role they play in fostering it. Today’s INBOX newsletter offers a range of journal articles from the past few years that showcase examples of how we can nurture student voice and why that’s important for all students. This past weekend I attended the OCTELA Conference in Columbus, Ohio, where teacher after teacher shared resources for and stories of innovative ways to inspire students to write and read and speak and listen. The abundance of ideas and enthusiasm was a potent reminder of all that teachers do in spite of the fact they so often work with limited access to the things they need. NCTE member Olivia Bertels and her colleague Brittany Wheaton brought that reality to national attention last week with the #armmewith campaign, which highlighted all we should be doing to support the critical work of educators. These past few weeks I’ve seen beautiful examples of members rushing to support each other. We were in touch with two English teachers from Marjory Stoneman Douglas High School, who posted a list of materials that their school needed, including inspiring novels. Within a very short time they said their entire wish list had been filled. 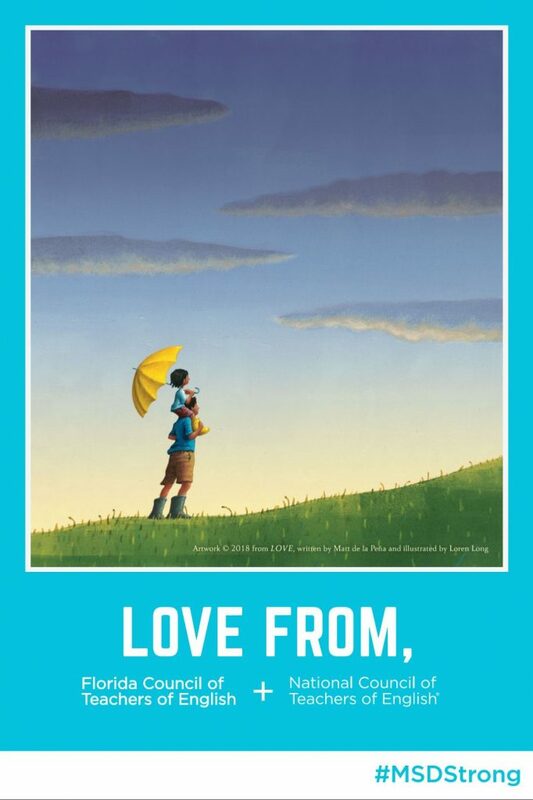 At the suggestion of the school’s principal and as a small gesture of hope and love, we partnered with the Florida Council of Teachers of English, illustrator Loren Long, and Penguin Random House to send a banner. The school is hanging banners throughout the building to welcome students and teachers back. There may always be huge gaps between what the public understands about education and what we know on the front lines, but within the NCTE community itself I have been so proud to see the empathy and compassion teachers have for their students and for one another. The time and effort people volunteered to select a compelling and useful program for the 2018 Annual Convention is a perfect example of this. The many ways in which I’ve seen members championing their students’ voices over the past few weeks is certainly another.